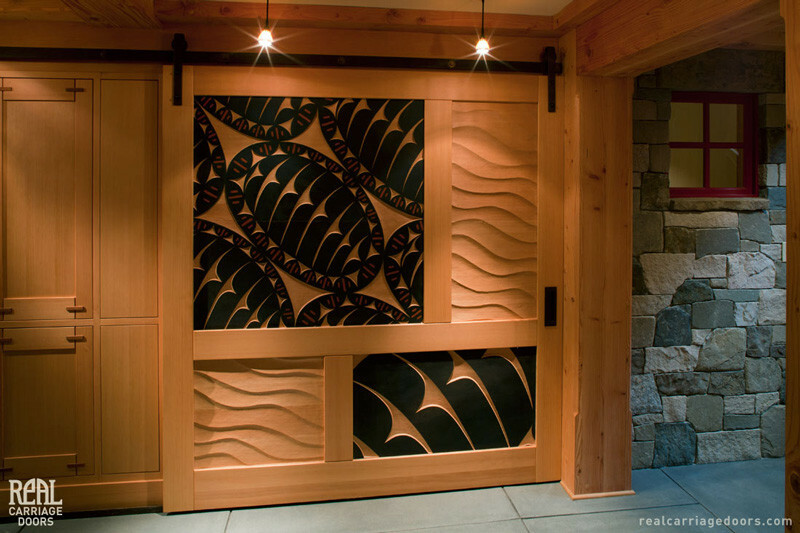 This sliding door represents a pattern of Lined Chitons. 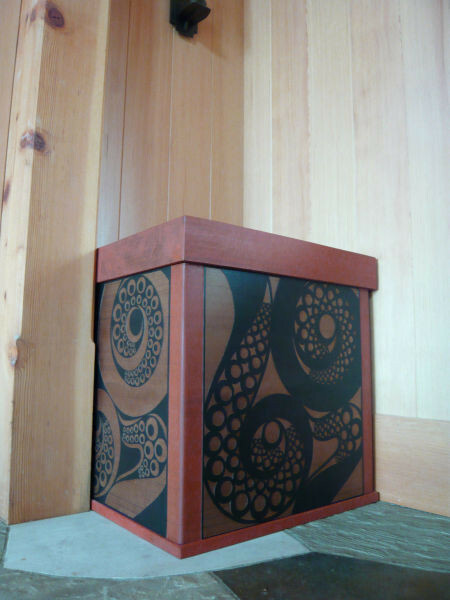 The unpainted panels represent waves. 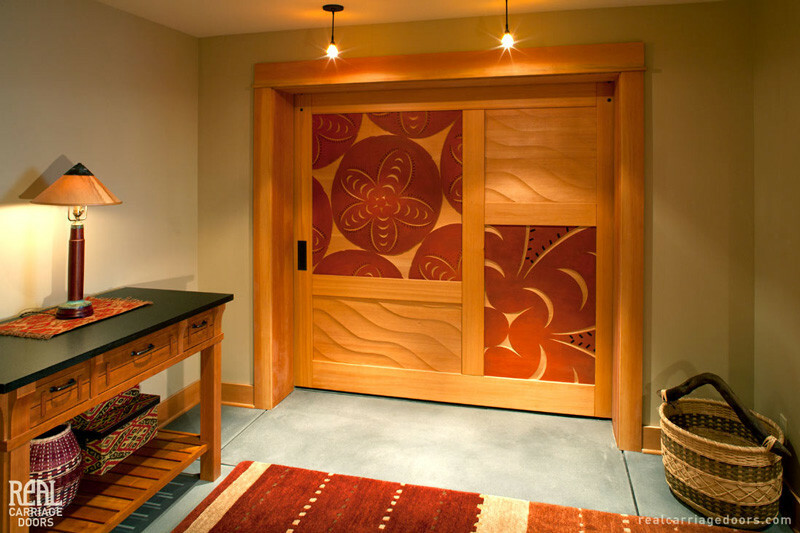 The door was designed painted and carved by the artist, built and installed by the Real Carriage Door Company. 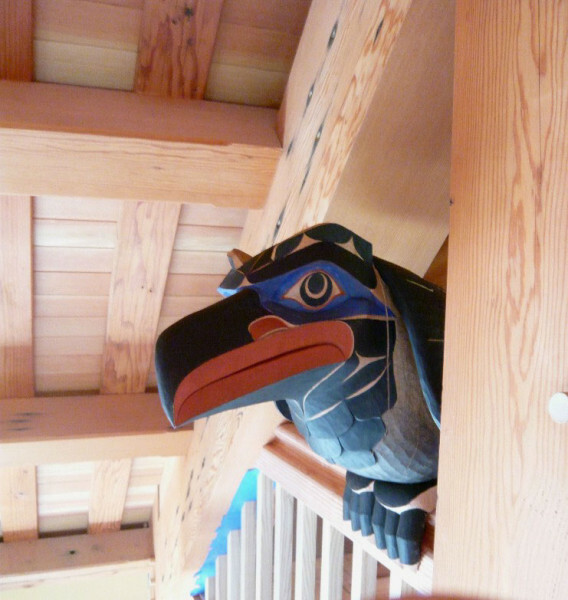 A pair of these sculptural Ravens, carved from Red Cedar, are perched among the rafters of this timber frame art studio. 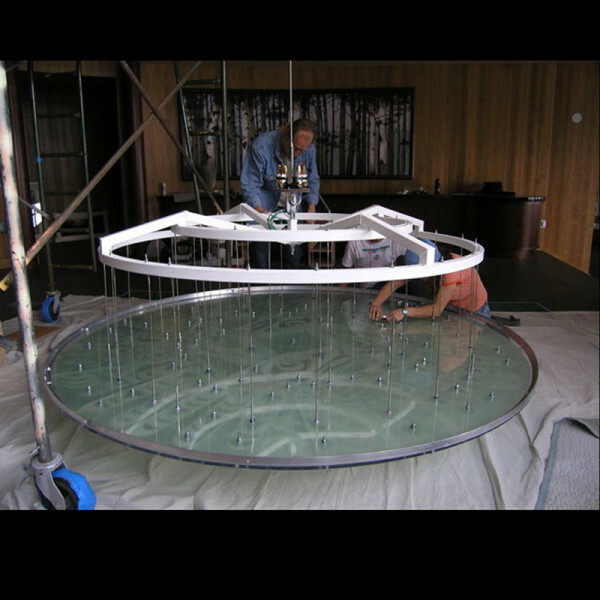 Four Eagles skylight in its lowered position ready to be raised into position. 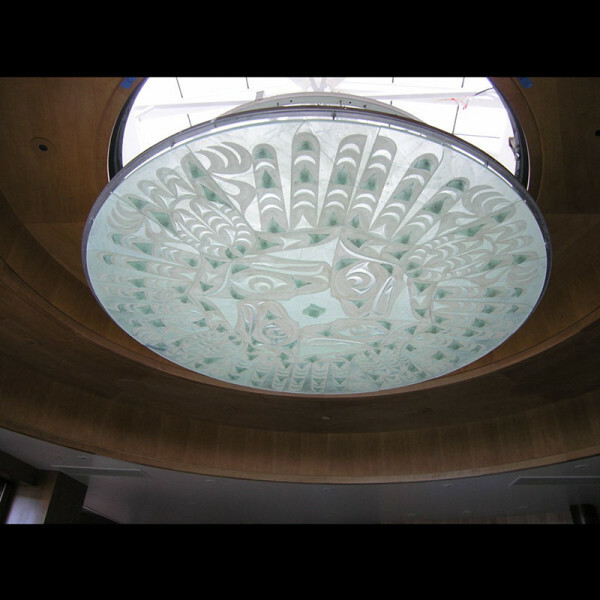 These panels were designed to represent the creatures of the sky on the left and creatures of the sea on the right. 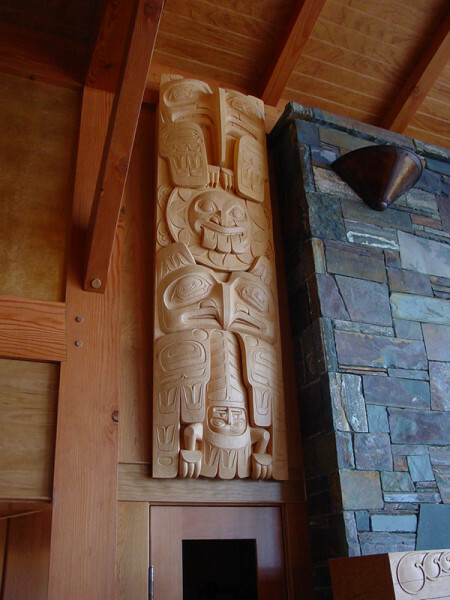 The mantle is designed with a bird face in a clamshell corona in its center with a wind motif moving to the creatures of the wind side, while waves march toward the creatures of the water. 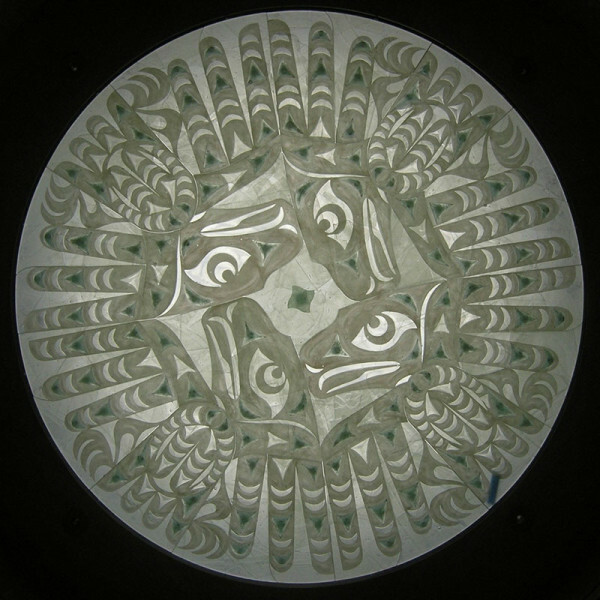 This panel represents the creatures of the wind Raven and Eagle with the Sun in the center. 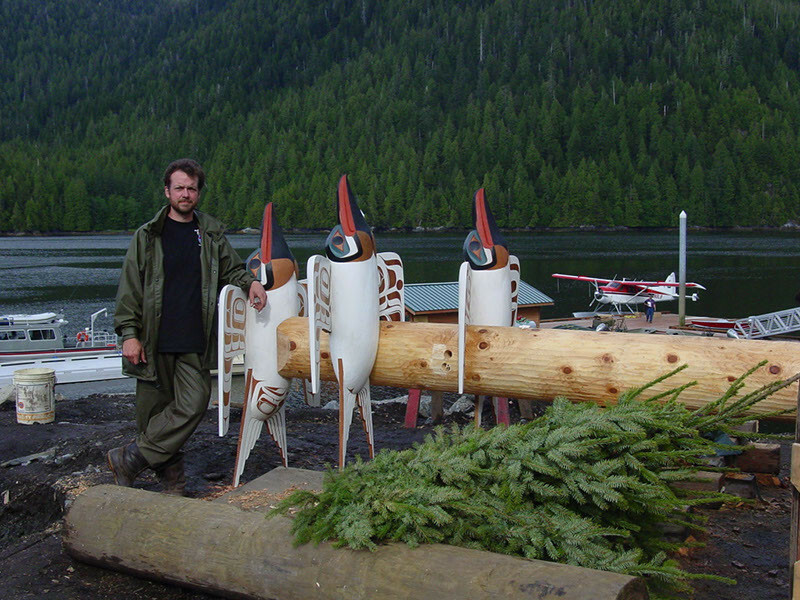 The Terns totem assembled prior to being lifted into position. 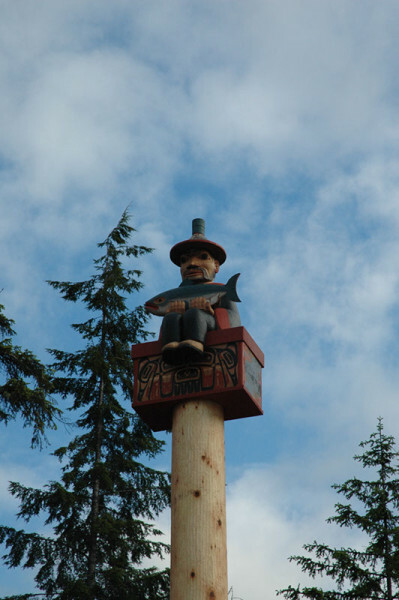 The Chief of Mink Bay Totem 34' tall, Red Cedar, Exterior Latex Paint. 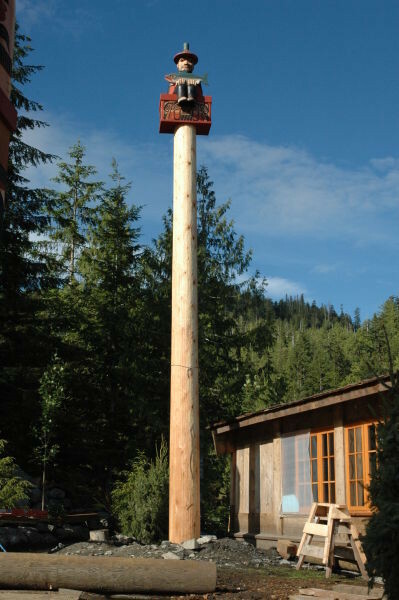 This image shows how the top of the totem was installed. 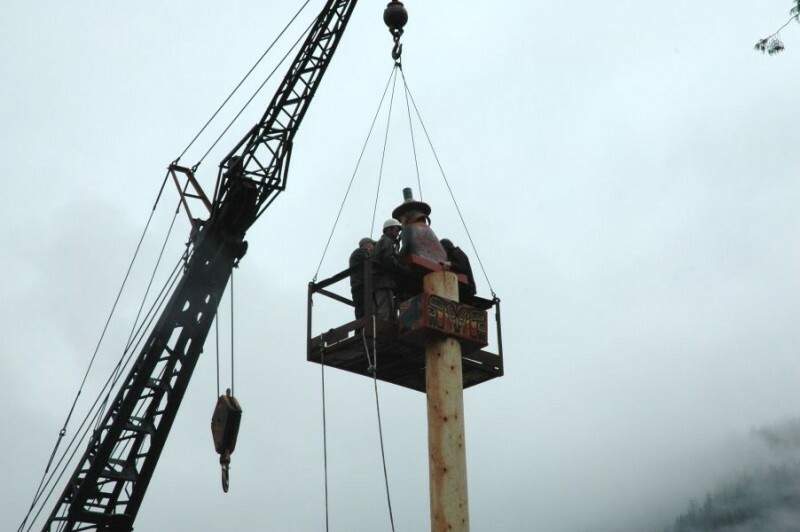 David franklin is in the white hard hat a and his team is in the basket suspended from the crane as the top sculpture is lifted onto the top of the pole. 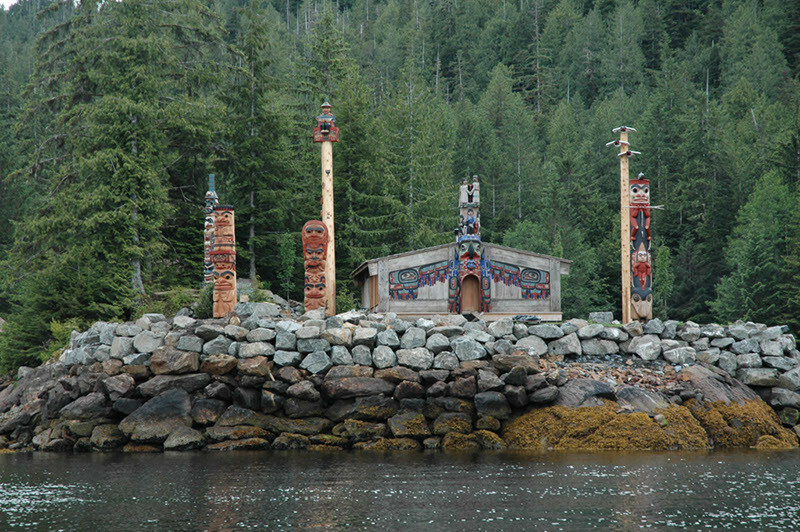 Shown is the complete Mink Bay installation. 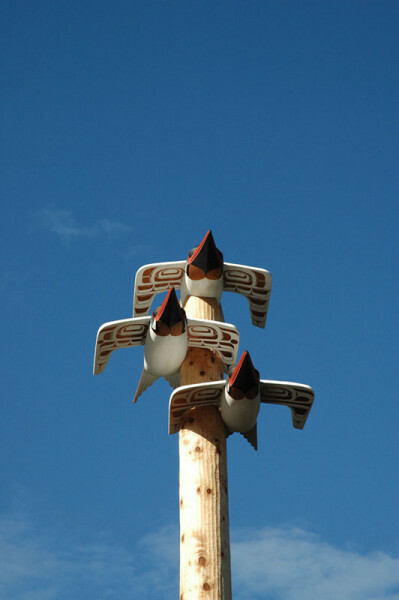 Two poles I created are included along with totems by Steve Brown, Joe David and Loren White. 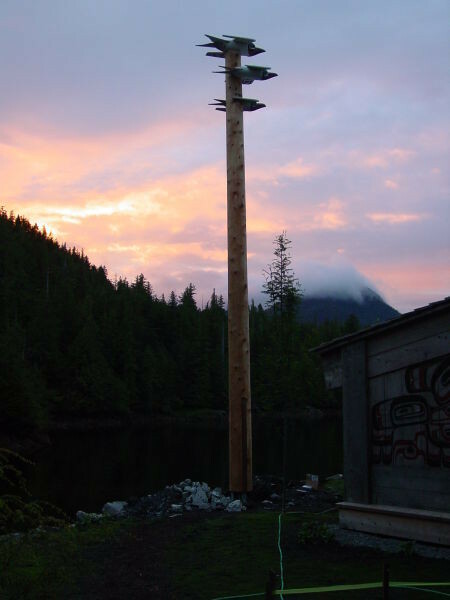 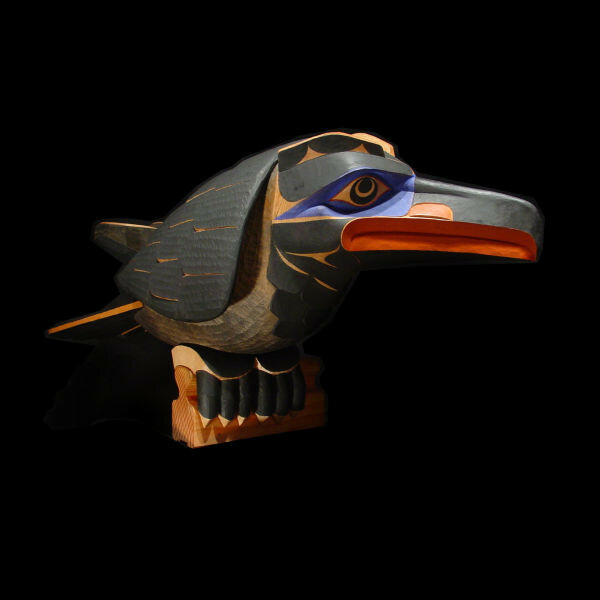 There is also a totem by Duane Pasco and his Longhouse, where he taught me and many others to carve when it was at its original location near Poulsbo, Washington. 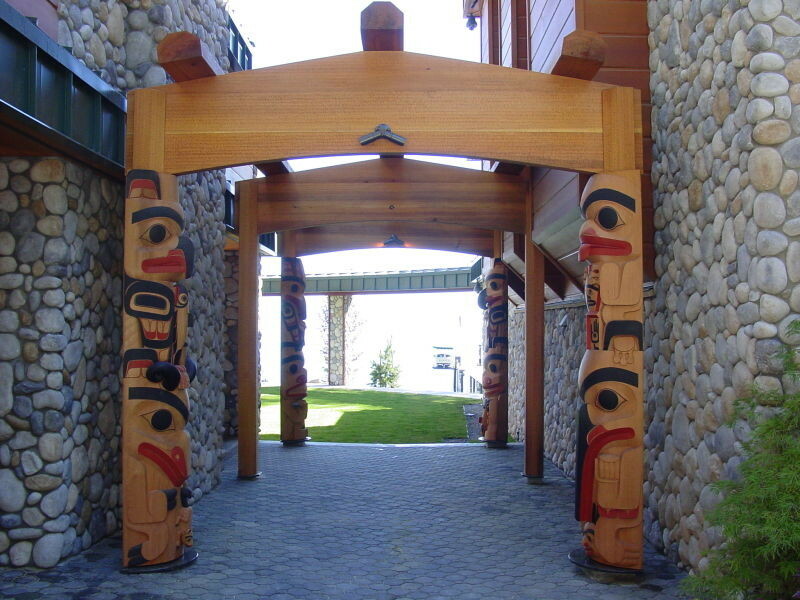 Over the years I have worked on a number of private art installations all over the West, from remote Southeastern Alaska to Lake Tahoe. 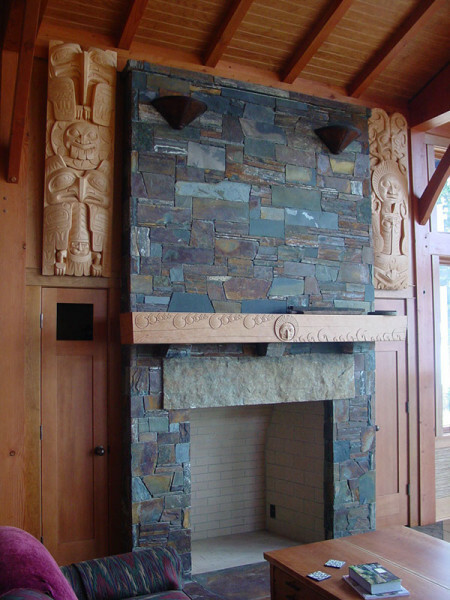 I’ve learned from and collaborated with amazing artists wonderful clients, architects, contractors, carpenters and so many amazing people it would be impossible to describe. 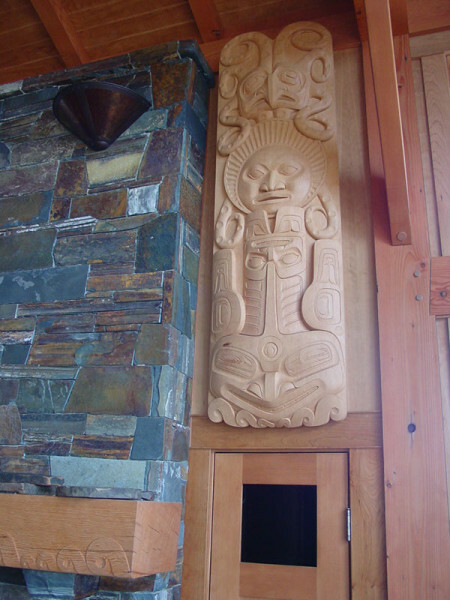 Many great people have shared their skills, knowledge and muscle with me to make these projects possible.